Preheat your oven to 180C/350F/Gas Mark 4. Trim and cut the rhubarb and place half of it in a saucepan with the golden caster sugar, the water and the ginger wine and simmer gently until syrupy. Halve the strawberries then place all the fruit and rhubarb syrup into a baking dish. 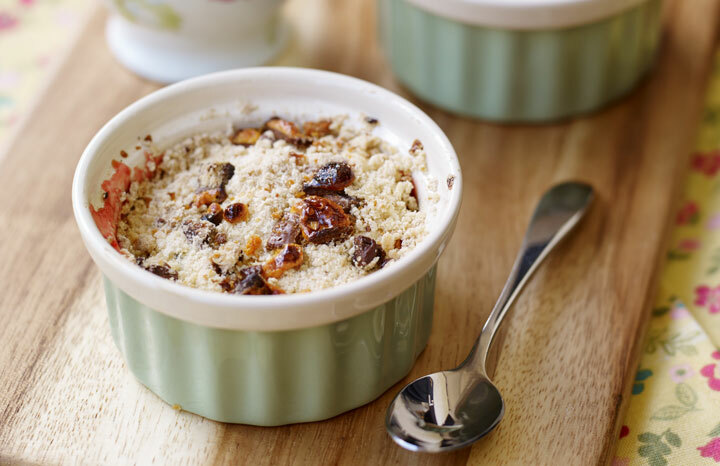 To make the crumble, put the butter, flour into a bowl and rub with your fingers until it resembles bread crumbs. Stir in the sugar, ginger and the crushed Crunchie bar and sprinkle generously over the fruit. Bake for 30 minutes until golden and bubbling.